Seating is limited, pre-registration is recommended. 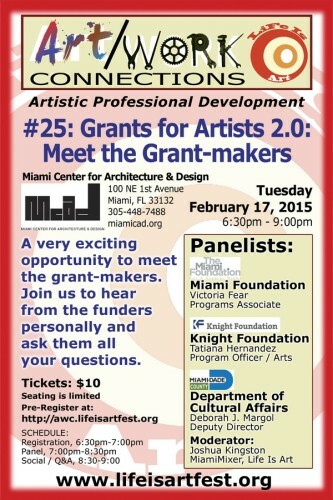 Following the outstanding response to our first grants seminar back in July of 2014, we are following up with an exciting opportunity to meet representatives from three of the main funders in Miami, the Miami Foundation, the Knight Foundation and the Department of Cultural Affairs. This is a rare chance to hear directly from the grantmakers and ask them all your questions. Did you know that individual artists can receive grants without being a charity organization? That is right, there are grants out there available to artists directly. Come and learn what the grantmakers are looking for and how best to approach them with proposals. Approaching foundations often seems overwhelming and intimidating, but grants are actually managed by people who want to help you do great things for the community. We are going to introduce you to the real people who really work at these institutions so that next time you go to apply, you will have a friend on the inside. PRE-REGISTRATION IS NOW CLOSED. PLEASE REGISTER AT THE DOOR. The Miami Foundation provides civic leadership, bringing stakeholders together to tackle issues of concern in our community. Working together with our Fundholders and community partners, we leverage collective knowledge, creativity and resources for a greater impact than any one of us could make alone. Knight Foundation supports transformational ideas that promote quality journalism, advance media innovation, engage communities and foster the arts. We believe that democracy thrives when people and communities are informed and engaged. The Miami-Dade County Department of Cultural Affairs and its volunteer advisory board, the Cultural Affairs Council, develop cultural excellence, diversity and participation throughout Miami-Dade County by strategically creating and promoting opportunities for our communityâ€™s thousands of artists and not-for-profit cultural organizations, and our residents and visitors who are their audiences. The Department of Cultural Affairs and the Cultural Affairs Council provide grants and technical assistance to cultural organizations and individual artists; develop and improve cultural facilities; create and advance arts education, public information and outreach programs; advocate for effective cultural policies and for more public and private resources to invest in cultural development; and promote and market our cultural assets broadly and innovatively. Joshua Kingston has been a freelance writer for nearly twenty years. He is the Vice President of Operations for the successful Eleazar Delgado Studio, as well as the Chief Curator of the Miami Mixer monthly group art show. A graduate of the University of Miami, he has years of experience successfully writing grants for non-profits and artists. The Miami Center for Architecture & Design is the place for everyone interested in design and the built environment, with community meeting space and educational programs to enhance public appreciation for architecture and design. MCAD is home to AIA Miami as well as the Downtown Miami Welcome Center, in partnership with the Miami Downtown Development Authority. The Welcome Center is â€œeverything Miamiâ€ â€“ cultural events, attractions, maps, history and more! MCAD houses flexible exhibit/gallery space that accommodates lectures, seminars and meetings, space for urban lab studios and flex meeting rooms. About Life Is Art, Inc.